Every year for my dad's birthday and Father's Day, I like to make him a special dessert. Thing is, before I even ask, I already know it's going to involve lemons. Don't believe me? Here's this, this, this and this dessert I've made solely from his requests and/or love of lemon. Me: Dad! Start thinking about what you'd like me to make for your birthday dessert! Me: ....that's it? What kind of frosting?? And that's exactly what he got. But triple-fied. 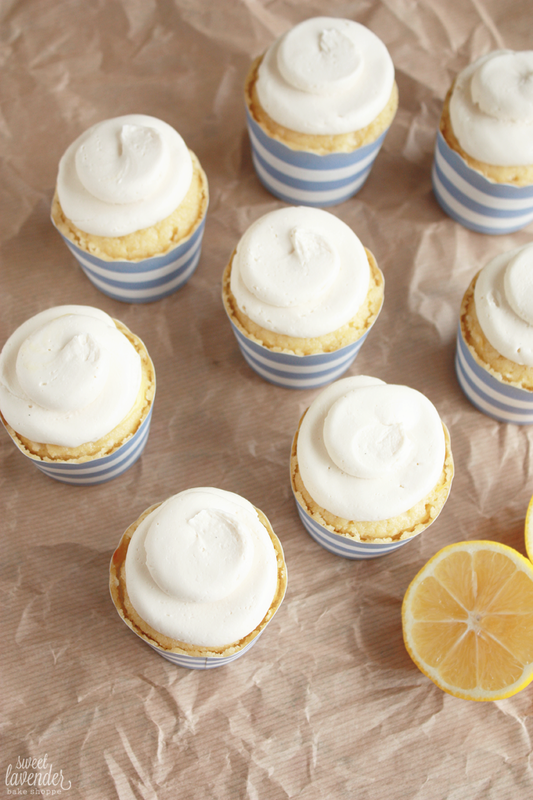 Because if you're a lover of lemon desserts and you're asking for lemon cake for your big day...you're going to get yourself the lemoniest of lemony cakes. Every ounce of that thing is going to ooze and seep lemon. It's going to make the other members of your family (who aren't as much lovers of the fruit as you are) kind of hate your guts, its so lemony. In fact, one is going to wish it was all comprised solely of chocolate. Lots and lots of chocolate. Any who, they'll eat their portion regardless because, cake. Everyone loves cake. And you, you're going to think you've died and gone to a lemon scented heaven. 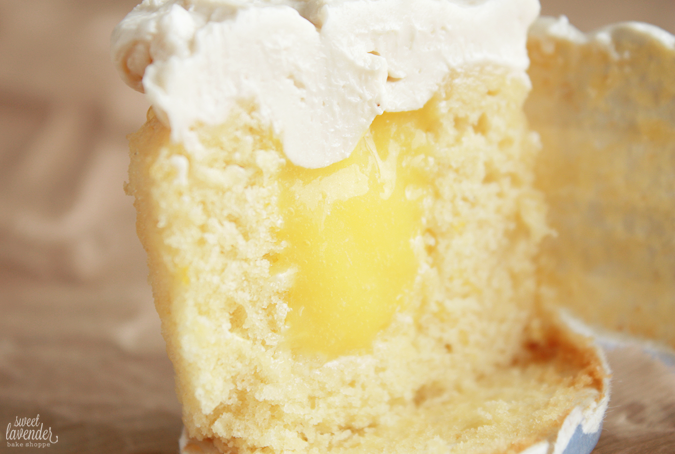 That's what lemon birthday dreams are made of. 1. In a medium bowl, add your butter. Top bowl with a fine mesh sieve or strainer and set aside. 2. In another medium glass or non-reactive metal bowl, whisk together the egg yolks, egg, lemon juice, zest, and the honey. Place over a pot of gently simmering water (do not let water touch bottom of bowl) and whisk continuously until mixture thickens- about 9-11 minutes. Do not leave and do not stop whisking. 3. Once mixture is nice and thick, without having curdled or cooked the eggs (also test by seeing if it coats the back of a wooden spoon) pour into your sieve over the butter and strain through. This will catch ANY cooked egg that might have accumulated. 4. Stir curd together until butter is completely melted and incorporated. Place into an air tight container and allow to cool completely in the refrigerator. 1. 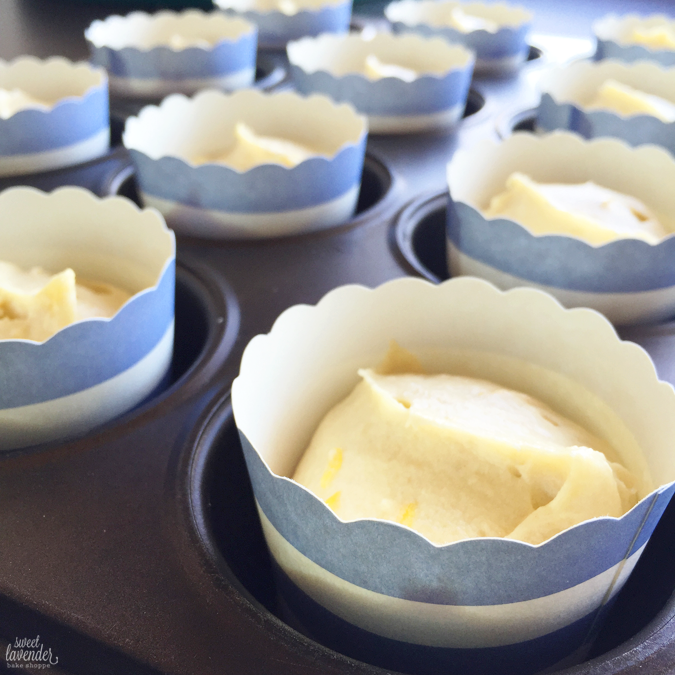 Preheat oven to 350°F and line muffin tins with cupcake liners. Set aside. 2. Into a large bowl, sift together the flour, baking powder and sea salt. Set aside. 3. Into the bowl of your stand mixer, fitted with the paddle attachment, beat together the butter and sugar until fluffy and creamy on medium high speed. Stop mixer and scrape down sides and bottom of bowl. Next add your eggs one at a time, stopping and scraping down bowl between each addition. Mix in egg completely before adding another. Turn speed up and beat well. 4. Next, add in the milk, vanilla extract, 3 tablespoons lemon juice and lemon zest and mix until completely combined. Scrape down sides and bottom of bowl and mix together again. 5. Finally, add in the sifted flour mix and mix until JUST combined. 6. Using a 2 to 2 1/4" ice cream scoop, scoop dough into your cupcake papers. Using an ice cream scoop like this ensures even distribution of your batter as well as clean surfaces! Yay! By using the 2" ice cream scoop, I was able to get exactly 24 cupcakes. 7. Bake cupcakes in the center of your oven for about 24 minutes, turning pans around half way through baking. Cupcakes are done when a toothpick inserted in the middle comes out with crumbs. 8. 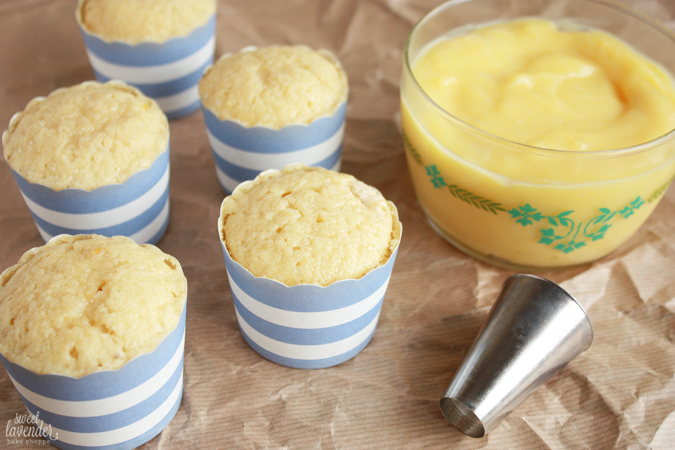 Allow cupcakes to cool at room temperature. Then place in an air tight container and allow to chill completely in the fridge for a couple of hours or best- overnight. 1. 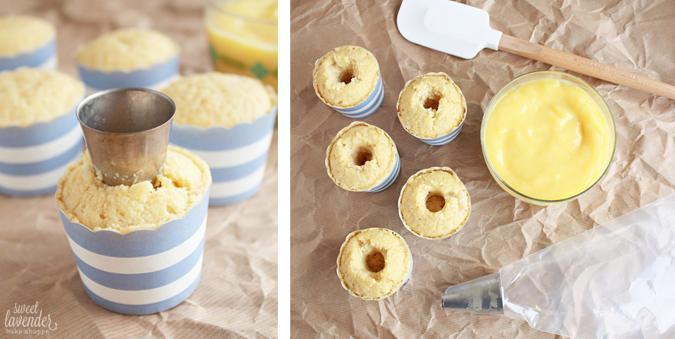 With an extra large piping tip or a small pairing knife, cut a hole in the middle of each of the chilled cupcakes. By doing this cold, you'll help the cupcakes keep their form and not break apart. Make cake crumbs with the middles you're removing (or snack on them like I did). Make sure to not go all the way to the bottom of your cupcake. You'll want a layer of cake at the bottom separating the curd and wrapper! 2. Once all the middles have been removed, fill a pastry bag with your chilled lemon curd and fill each hole almost to the top with curd. Set cupcakes aside. 1. In your stand-mixer bowl, whisk together your egg whites and cane sugar. Create a double boiler with a pot of gently simmering water and this stand-mixer bowl. Of course you could alternately use a regular bowl- metal or glass- in place of a stand-mixer bowl, if you are choosing to make frosting with a hand mixer. 2. While water is gently simmering and bowl of egg whites and sugar is on top, continuously whisk together until sugar granules are completely dissolved. You can find this out by sticking a finger in the mix and rubbing mixture between two fingers. If it feels completely grain-free, you're ready! Any sand-like feeling? Place back on simmering water, whisking, and cook a few minutes more. Careful, you do not want to cook those egg whites! So make sure water is gently simmering, water is not touching bowl whatsoever and that you cook until those granules are just dissolved! 3. Once sugar is dissolved, place mixer bowl back on stand-mixer and with your whip attachment whisk on medium high speed. Once froth develops, turn mixer up to high and continue to whisk egg whites until stiff peaks form and the bottom of your mixer bowl is COMPLETELY cool to the touch. This could take 10-15 minutes depending on how long you cooked the mixture prior. 4. Once your egg whites have become stiff and your bowl is cool, turn mixer back down to medium low. Add your vanilla extract and lemon juice. Next, one cube at a time, add your room temperature butter. Continue mixing and adding butter until all of the butter has been completely incorporated. Add salt if wanting. IF YOUR BUTTERCREAM LOOKS BROKEN (i.e. liquid and chunks) CONTINUE MIXING. IT 99% OF THE TIME WILL COME TOGETHER. All you need is for your butter to incorporate more into the whole mix. There's two downfalls to homemade buttercream: heat and cold. Both can help it and hurt it (and a buttercream master knows how to use both to their advantage).If it's too soft- maybe the egg white mix was too warm...or butter was too soft- and butter is melting- it will cause your buttercream to break. By using those ice packs/ice bath help to firm up the butter, it should bring the buttercream back together. If the butter was too cold when added- it will take the time it takes for butter to soften to come together. So you'll need to determine which one it was. Too cold- let mix at room temp for a long time. Too warm- chill it up. Make sure to mix completely and stop to scrape the sides and bottom of bowl. Make sure to incorporate it all! 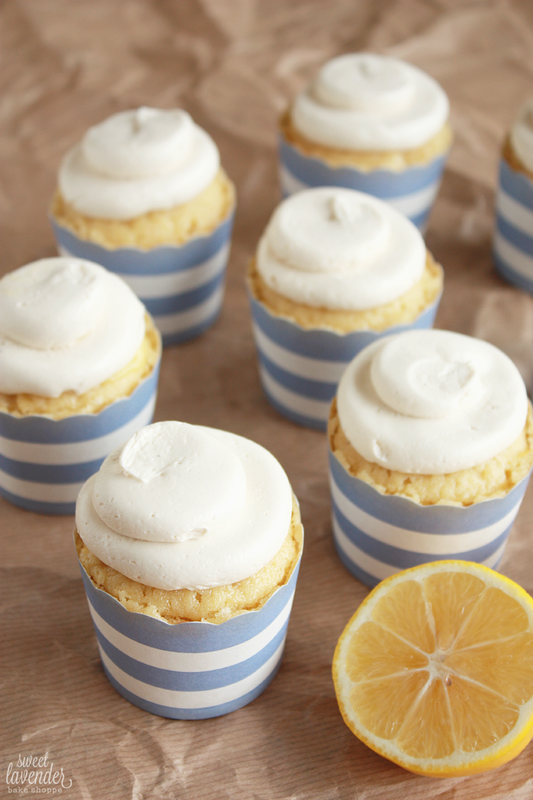 Finally, pipe the buttercream frosting onto your cupcakes and enjoy! *If using frosting that day keep room temperature with plastic wrap on top. If using next day- refrigerate (up to 3 days) in an air tight container. Can also freeze up to a month. For refrigerated buttercream, bring back to room temperature completely, on the counter, and then beat with a paddle attachment until light and fluffy. For frozen, defrost overnight in fridge then follow refrigerated instructions. 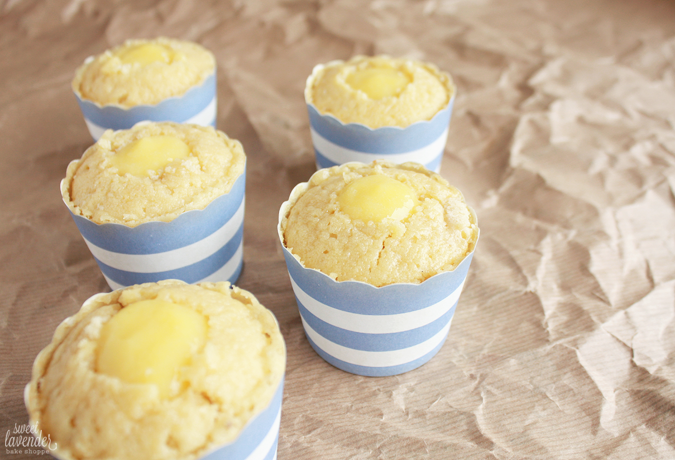 *Cupcakes can be made a day in advance and stored in fridge. *Curd can be made a day or two in advance and stored in fridge. I love the cupcake wrappers you used. So lovely with the yellow!